"Watson claims he then discovered a second time that his mother was being given medicine without her consent or knowledge. No formal complaint was ever made, no investigation was ever held, but at Watson's insistence, his mother was never covertly sedated again. In 1999 she contracted cancer, and this time - to her son's surprise - she gave her own consent for pain relief. Although by then in an advanced state of dementia she was still quite capable, he points out, of making a "treatment decision" for herself. But as the pain relief levels increased, her mental condition deteriorated. "She would say, 'Where is Hunter?' I'd say, 'I'm Hunter.' She'd look puzzled. I'd say, 'the boy you used to look after', and that seemed to reassure her. She'd say, 'Yes, and now you're looking after me.'" In January 2000, Helen Watson passed peacefully away. But by then her son had begun his campaign against covert medication, which has now taken him all the way to the Scottish parliament. New guidelines are under review, and he hopes to see the practice explicitly outlined in the near future. "I would like," he says simply, "Scotland to be the first country in the world to say, 'Look, this is wrong - it shouldn't happen.'" He must have made himself quite a thorn in the side of many authorities - he is, in his own words, "a bit of a serial campaigner" - but even he seems slightly amazed that his long campaign may at last be about to rewrite the rights of the elderly. I ask if he has been fighting all these years for his mother, as a tribute, or memorial, to her. He looks at me in quiet astonishment. "No," he says softly. "I'm doing it because it is wrong." "Now that the final day has arrived on which signatures can be added to my petition PE01667 on mental health and incapacity legislation I have produced the attached paper which not only makes the case for a wide review being necessary but also provides reasons for my being hopeful that one will take place. You might find it of interest. "Calling on the Scottish Parliament to urge the Scottish Government to conduct a wide review Scottish mental health and incapacity legislation and, when doing so, to take due account of recent developments in international human rights law." "In 1997 I began writing to my MP in an attempt to persuade Parliament to legislate to ensure that antipsychotic drugs were not concealed in the food or drink of elderly care home residents. After the establishment of the Scottish Parliament in 1999, I began writing to MSPs in an attempt to achieve the same aim. When it became apparent that this approach was not going to be successful I submitted a petition to the Public Petitions Committee. This petition, number PE867 (http://archive.scottish.parliament.uk/business/petitions/docs/PE867.htm), generated great media interest because it had not been generally realised that drugs were being concealed in the food or drink of some care home residents: I was interviewed on both radio and television and the story was covered in the UK press. Regrettably, this petition was unsuccessful. It was assumed that my concerns would be addressed by revising the Code of Practice for the Adults with Incapacity Act. Basically, the revision implied that covert medication is permissible provided that it is done in accordance with the provisions of the Adults with Incapacity (Scotland) 2000 Act (the AWI Act). However, given developments in the field of human rights since the passage of that Act, it would seem to be now appropriate to review it. In 2008 I was made aware of one particular case which made it clear that the Mental Health (Scotland) Act 2003 (the 2003 Act) was not working as well as the Scottish Parliament had expected. Basically, it suffers from the same flaw as does Part 5 of the AWI Act. In each case, too much power is given to health professionals who, like the rest of us, are not infallible. Nor do they always adhere to the laudable principles which are supposed to underpin both the AWI and the 2003 Act. As a consequence, many of the people who are treated under the provisions of those Acts have their human rights violated. Because of my concerns about the 2003 Act, and the absolute refusal of the Scottish Government to act to address those, I submitted petition PE01494 which called for the Scottish Parliament to urge the Scottish Government to amend the Mental Health (Care and Treatment) (Scotland) Act 2003 to ensure that it is compatible with the European Convention on Human Rights. Although I and the person who seconded my petition were both permitted to address the Public Petitions Committee and although that Committee gave various bodies and individuals an opportunity to submit evidence, the Committee agreed to close my petition without discussing it. I was informed that it agreed to do this as the consequence of an instruction from a senior official or civil servant. In that submission, it is stated that the relevant law includes the "Scotland Act 1998 which requires that all legislation of the Scottish Parliament must be compatible with ECHR rights. It also requires that Scottish Ministers must observe and implement the UK's other international obligations, which includes obligations under international human rights treaties the UK has ratified. There are several international human rights treaties that have application to mental health and mental disorder. This submission focusses on the UN Convention on the Rights of Persons with Disabilities". (My italics). The Scottish Government should examine the possibility that if Scottish mental health and incapacity legislation is not amended to take due account of those judgments of the European Court of Human Rights to which I make reference in my paper entitled "Important Court Judgments 2" then it will not be ECHR compatible as is required by the Scotland Act. My paper also contains relevant judgments of domestic courts. These have established case-law which makes clear that an adult with capacity can only be treated with that adult's informed consent and that there must be a presumption of capacity. Among the cases to which reference is made is Montgomery v Lanarkshire Health Board, 2015. Comments on this case appeared in the May 2017 edition of the BMJ. Among those comments is the following: "The doctor might think that disclosure of certain information could lead the patient to a decision that is not in their best interests, as was true in the Montgomery case. But the ethical and legal position is clear: doctors must not withhold information simply because they disagree with the decision the patient is likely to make if given the information". The need to provide full information about risks and to not assume that there is a complete lack of decision-making capacity is of particular importance when a doctor prescribes an antipsychotic drug for a person with dementia. The administration of an antipsychotic drug to such a person, especially if carried out for a significant period, increases the risk that that person will die prematurely or have a stroke. In a 2014 report prepared by the Mental Welfare Commission for Scotland (MWC) it was noted that of the 336 dementia patients in the 52 NHS units surveyed 166 patients (49%) were being given antipsychotic medication. The MWC commented "While this might be helpful in relieving symptoms such as hallucinations, delusions, agitation or aggression there are known risks for people with dementia. All antipsychotic medications increase the risk of stroke or death, many can impair mobility and increase the risk of falls". In June 2010 there was published Scotland's National Dementia Strategy. In section 97 of the strategy it is stated "This strategy is making a commitment to a reduction in the level of prescription (of psychoactive medication) during 2011 and a further reduction for future years". Regrettably the production of strategies is totally ineffective if they can be ignored with impunity: the document entitled "Medicines used in Mental Health" reveals that for the period 2009/10 to 2015/16 all NHS Boards showed an increased prescribing of antipsychotic drugs. Although the data does not indicate whether this increased prescribing applied to those with dementia, there can be no assumption that it did not. In May 2017 there was published a report entitled "Scotland's Mental Health and Capacity Law: the Case for Reform". It was produced jointly by the Centre for Mental Health & Capacity Law and the Mental Welfare Commission for Scotland. This report notes that," ... in order to ensure compliance with developing international human rights standards ... there is a need to revisit and, where necessary reframe, our mental health and capacity law". The report draws attention to the possibility of small changes being made to the existing legislation prior to the production of a completely new and unified Act. Account should also be taken of the UK submission to the committee which monitors compliance with the Convention on the Rights of Persons with Disabilities (CRPD) within those countries which have ratified and hence which agreed to comply with that international human rights treaty. Among the issues raised are the use of chemical restraint and the abuse of people in residential care. mental health patients could no longer be held down and injected with psychiatric drugs against their will; nor could they continue to be given ECT even though they resist or object to that treatment. non-consensual treatment would be kept to an absolute minimum." "In the attached paper I suggest that the Scottish Government might place too much weight on advice from experts when it considers the need to make significant changes to Scottish mental health and incapacity legislation. One acknowledged expert in the field of mental health is the consultant psychiatrist Dr David Christmas. I have no idea whether he ever advises the Government about mental health and incapacity matters. However, if he does then it is possible that some of the advice which he provides might be misleading. In the attached paper I explain why I am of this opinion. A copy of the paper has been sent to Dr Christmas so that he can comment if he is of the opinion that I have been misrepresenting any of the statements which I have attributed to him, statements which I seem to recall that he made at the CPG (Cross Party Group) meeting on mental health that was held on 26 April 2017. "On the 26th of April 2016 I attended the Cross Party Group on Mental Health and Older People, Age and Ageing, held at the Scottish Parliament. The following is an account of my experience of this meeting and some reflections on conversations that have followed it. At the end of this post are included two papers that were submitted ahead of the Cross Party meeting: a paper by me entitled “May it be granted the older you are” and a paper by Mr Hunter Watson entitled “Psychoactive Medications”. I have been to quite a number of Scottish Parliamentary Committee meetings but this was the first Cross Party Meeting that I have attended. How welcome it was to see such a good turn out with a packed committee room. I am inclined to conclude that this indicates how important it is that we value our older generation. It was however unfortunate that other parliamentary business meant that various parliamentarians had to absent themselves. I was keen to attend this meeting for a number of reasons. Having an interest in the Scottish Government’s “Ten Year Vision” for Mental Health I had attended one of its consultation events in Edinburgh and had also submitted a written response. There were 574 written responses in total, which again seems most encouraging. Given that opportunities for anyone to raise discussion, at parliamentary level, about the Scottish Government’s ‘Ten Year Vision’ may not come along very often, I felt it was important, as the only NHS psychiatrist for older adults at this Cross Party meeting, to do my best to put forward the experiences of my patients. I was very impressed that the convener, Sandra White, MSP made sure that as many voices as possible were heard at the meeting. I wrote to thank her for this. I was particularly struck by the compelling and worrying testimonies of Rosemary Carter and Dianna Manson whose experiences as older adults with mental health issues remind us starkly how important it is that policy makers consider very carefully the consequences of visions set for the years ahead. Rosemary Carter highlighted her experience of how the dominance of cognitive assessments in my profession has reduced capacity to care for those who have non-cognitive mental ill health. As a professional working in this area I share her concern and am of the view that Rosemary is far from alone in her experience. When the Dementia Strategies and Targets were first introduced in Scotland from 2010 onwards, it was my concern about this potential for inverse care, and for increased stigma associated with ageing, that led me to advocate publicly for a timely approach to the diagnosis of dementia. I did so at a time when this approach had no support whatsoever from policy makers, healthcare or the Mental Welfare Commission. I thought that Angela Dias of “Action in Mind” spoke with clarity and genuine concern about what she termed “institutional discrimination” relating to older adults with mental health issues living in Scotland today. Mr Hunter Watson’s concerns about human rights for older adults do, in my opinion, need to be carefully considered. The Principal Medical Officer for Scotland, Dr John Mitchell, acknowledged several times the evidence that those with chronic mental health disorders die 15-20 years earlier than those who do not. He stated at this meeting that this is a “huge finding, a universal finding, a huge inequity”. Academics are increasingly of the view that one of the potential reasons for such early death has been the prescribing of psychiatric medications. This is why I mentioned a number of times at the meeting the widely gathered evidence (PE1493, Sunshine Act for Scotland) that the pharmaceutical industry continues to have a significant role in the “education” of Scottish doctors in the prescribing of psychiatric medications. I thought the presentation by Dr David Christmas was most interesting and share his concern that there is an imbalance in research studies across the age ranges. I raised a number of questions with Dr Christmas because he works as a “super-specialist” and so deals with a very select group of patients. At the Cross Party meeting Dr Christmas stated that “depression is under-recognised across all age groups” and that “maintenance treatment has a good risk-benefit ratio.” He did so without acknowledging that these statements cannot be made with absolute certainty. I have attended a wide range of GMC-required Continuing Medical Education (CME) and so over the years have found that I have attended a number of educational talks given by Dr David Christmas. He always carefully talks through his declarations of interest which for at least the last five years do not include any financial interests other than his employment with NHS Tayside as the Clinical lead of the Advanced Intervention Service. Dr Christmas is a member of the Psychopharmacology Committee of the Royal College of Psychiatrists. The Chair of this most influential committee (in terms of the prescribing of psychiatric drugs) is Professor Allan Young, a “key opinion leader”. Professor Allan Young declares his extensive financial interests as follows: “Paid lectures and Advisory Boards for all major pharmaceutical companies with drugs used in affective and related disorders” . A similar key opinion leader, Professor Stephen Stahl, gave a keynote talk at the British Association of Psychopharmacology in 2015. As he is American, and they have a Sunshine Act, it is possible to establish Professor Stahl’s earnings from promoting psychiatric drugs. When last looked at, this was, more than $3.5 million dollars. In the absence of a similar Sunshine Act in the UK we cannot establish the scale of payments made in the UK. Dr Christmas has given educational lectures alongside Dr Hamish McAllister-Williams who is also a member of the Psychopharmacology Committee of the Royal College of Psychiatrists (RCPsych), and who was appointed in 2012 as Director of Education for the British Association of Psychopharmacogy (BAP). Dr McAllister-Williams declares a wide range of financial interests with the Pharmaceutical Industry. Dr McAllister Williams is “a major contributor” to the RCPsych and BAP Continuing Professional Development programme. 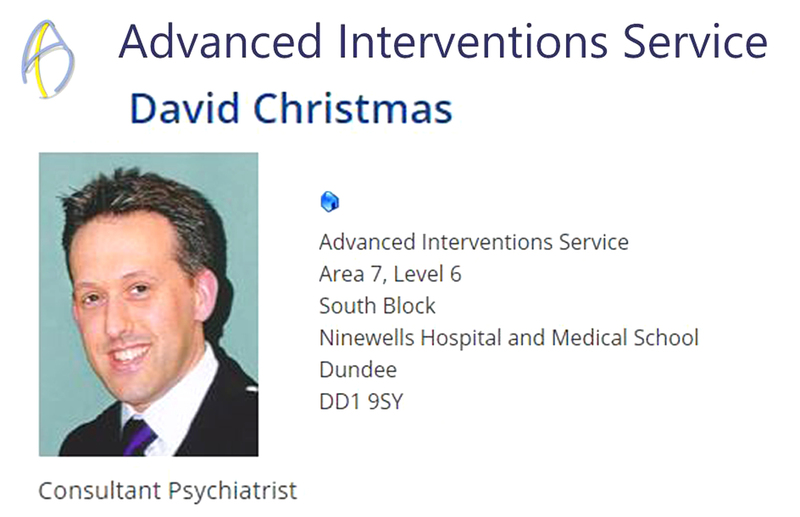 It was with this knowledge, of the influential position that Dr Christmas has in terms of the education of UK psychiatrists, that after the Cross Party Meeting I wrote to ask Dr Christmas to ask if he might support a Sunshine Act for Scotland? At the meeting Dr Christmas took time to carefully address other biases (which I share his concern about) but did not do the same for the financial biases that may affect the advice given by key opinion leaders. The same potential exists for research itself. In my correspondence with Dr Christmas I reminded him that I prescribe both antidepressants and antipsychotics but explain to patients that the best evidence we have is generally based on short-term studies and that all interventions (including psychological interventions) can have both benefits and harms. I have confirmed with Dr Christmas that I share his determination to seek science that is as objective as possible and that this means that I realise that biases do indeed come in all forms and not just financial. I simply argue that science should be based on transparency or it ceases to be science. My view is that it is not necessarily a bad thing if doctors are paid for their time and expertise working outwith the NHS. For example, working for NICE, or giving expert views to court. However, when a doctor has a financial “conflict of interest”, this can affect the treatment decisions they make, or recommend. These conflicts cannot be entirely avoided, and in many cases they are entirely reasonable. However, it is important that information is available on which companies have paid a doctor, so that colleagues and patients can decide for themselves what they think. For example, there is longstanding evidence that exposure to industry promotional activity can lead to doctors recommending worse treatments for patients. I have also discussed with Dr Christmas the view that proportionality of understanding should come in words as well as numbers and that the quantitative and qualitative require ‘parity of esteem’. In summary, I thought the Cross party meeting on Mental Health, Ageing and Older People was an excellent opportunity for a range of voices to share their thoughts and experiences. Such involvement is to be commended and I hope that both my profession and policy makers of all sorts may agree. ..."
"In the attached paper I explain why the Lesley McDade affair provides further evidence that it is essential that there be a full review of the 2003 Act. I also point out that yet again the Scottish Government has failed to provide satisfactory answers to written PQs. Finally I recommend that there be legislative reform in Scotland in order to bring Scottish mental health and incapacity legislation into line with modern human rights law, notably with the Convention on the Rights of Persons with Disabilities, judgments of the European Court of Human Rights and of the Supreme Court. "Yesterday evening I received 5 Emails, forwarded on from a woman who is a detained patient in a Scottish psychiatric hospital, not Fife. Dated from 20-29 January 2016. Which I have forwarded on to colleagues, to Colin McKay, Mental Welfare Commission, to MSPs in the woman's area, to my MSP Roderick Campbell, and to VOX (voices of experience) and HUG (Highland Users Group) contacts, for their information. In these Emails the woman says that she is not mentally ill but is to be subject to a forced depot injection fortnightly. And was given one electroconvulsive therapy (ECT) treatment on the day she entered the hospital. Her writing was lucid and made sense, containing observations of what went on in the ward and issues arising. I noticed that there were IT, knitting and pottery classes available. Nothing like that was on offer at Stratheden Hospital, Fife, in 2012. The female patient also said that independent advocacy was helpful and that she managed to eventually obtain a solicitor to act on her behalf, likely at a Mental Health Tribunal, appealing the 28 day detention. The patient says that she was put on to a 28 day S44 short-term detention, not a 72 hour one, "for the purpose of an Appeal under the Act". And says that she always receives a depot injection on the "premise" that she refuses to accept that she is mentally ill or that the diagnosis is correct. The Emails had long lists of points containing a variety of information and detail, past and present. They were not addressed to me in person but had been forwarded on so I assume that many other people also received these Emails. I think it's very useful that this woman has written about her daily experiences as a psychiatric patient on the ward. A personal diary shared with the outside world." "In the attached paper I emphasise that the lack of effective safeguards in the 2003 Act taken in conjunction with recent judgments of the European Court of Human Rights opens up the possibility that any involuntary mental health patient could raise a court action with a reasonable chance of success on the grounds that one or more of his or her human rights had been breached. Given what happened when a prisoner's court action led to the finding that being forced to "slop out" constituted degrading treatment and hence breached Article 3 ECHR it would be nigh certain that one successful court action by an involuntary mental health patient would be followed by many more, something that could result in the NHS paying out vast sums in compensation. As I have observed previously, in the period from January 2016 to August 2016 only 1.8% of the applications for a Compulsory Treatment Order were refused by the Tribunal. This paper provides information which should help to explain why that figure is so low. It quotes from three tribunal transcripts which are in my possession. These transcripts demonstrate that the level of proof at those particular tribunals was far too low. This is mainly because tribunal members consider psychiatrists and MHOs to be credible witnesses and are prepared to accept as fact any of their testimony. In my opinion, not only are tribunal members failing in their duty by not properly testing the evidence but they are demonstrating a measure of gullibility by being prepared to accept as gospel whatever evidence that is presented to them by a health professional. Sometimes the health professional might honestly believe what he is saying to the Tribunal even though it is untrue. On other occasions the health professional will deliberately be attempting to mislead the Tribunal in an attempt to persuade it to grant the sought for Compulsory Treatment Order. That happened on several occasions in the hearings for which I have the transcripts though I have only indicated one place in one transcript where a witness knowingly gave false evidence. In my comments on the transcripts I am also critical of the performance of the solicitor representing the mental health patient. There was a woeful failure on her part to attempt to test the evidence. No doubt the same criticism could be made of other solicitors should other tribunal transcripts become available for analysis. There has been a reluctance on the part of the Scottish Government to accept that the 2003 Act is not being implemented as Parliament had intended. I trust that the attached paper will be sufficient to persuade the Government that mental health tribunals are not effective safeguards against mental health patients being improperly deprived of their liberty and of being subjected to forced treatment which breaches their right to respect for private life or even their right not to be subjected to inhuman or degrading treatment. If the Government is persuaded of this then obviously the Government should take steps to address these serious issues. I and others look forward to seeing the report on the scoping study related to the forthcoming review of Scottish mental health and incapacity legislation. I cannot believe that it will fail to draw attention to the need for significant changes in order to address important human rights issues. The acronym “SEAN” stands for “Scottish ECT Accreditation Network”. The 2015 SEAN report contains statements of a factual nature but it also contains others which seem designed to divert the public from asking serious questions about ethical and human rights issues related to ECT. A study of the report also makes clear that the so-called legal safeguards designed to protect patients are worthless. ..."
you have provided Jamie Hepburn with a copy of my paper "Antipsychotic guidelines for dementia patients 2". I now attach reports of two court judgments and would be grateful if you could draw these to the attention of the Minister and suggest that either he reads them or that he instructs his officials to do so. These judgments clearly have implications for Scotland's mental health strategy. In the judgment relating to a refusal of treatment the report correctly notes that the judge observed that "Every adult capable of making decisions has an absolute right to accept or refuse medical treatment, regardless of the consequences of the decision. The decision does not need to be justified to anyone. Without consent any invasion of the body, however well-meaning or therapeutic, will be a criminal assault". The judge's observation should be assessed in conjunction with the GMC consent guidance which stresses that there must be a presumption of capacity :"You must only regard a patient as lacking capacity once it is clear that, having been given all appropriate help and support, they cannot understand, retain, use or weigh up the information needed to make that decision, or communicate their wishes". The judge's observation should also be assessed in conjunction with Article 12 of the Convention on the Rights of Person's with Disabilities and the General Comment on Article 12 issued by the UN Committee on the Rights of Persons with Disabilities. I am not aware of any health professional being prosecuted as a consequence of having treated a patient without first having obtained consent. I am aware, however, of successful civil actions being raised by patients who suffered harm after being treated without having given their informed consent. They had not objected to the proposed treatment but might have done so had they been informed of the significant risks associated with the treatment. I attach a report of such a case. A jury in the USA awarded a woman $635,177 damages for long-term memory loss following electroconvulsive therapy. Although the report does not make the reason for the award completely clear it seems that there was a failure to warn the woman about the risks and that is likely to have been the main reason for making the award. It would have been unreasonable to have awarded damages for memory loss if the woman had been made well aware of that risk and had agreed to go ahead regardless. One implication of the attached reports is that it is never appropriate to treat a competent patient against his or her will. Hence section 242 should be deleted when the 2015 Mental Health Act is amended as should that part of the Act which permits electroconvulsive therapy to be given even if a patient resists or objects to the treatment: ECT is not the safe and effective treatment that its proponents claim it to be. Evidence from those who supported petition PE01494 on mental health legislation revealed that some psychiatrists made no serious attempt to assess the capacity of their patients to make decisions about medical treatment. The Code of Practice which replaces the Code for the 2003 Act should emphasise that this situation must change and that health professionals must seek not only consent, but also informed consent. "The use of these drugs in those with dementia has substantial clinical risk attached, including a conservative estimate of 1,800 extra deaths and 820 extra serious adverse events such as stroke per year." Here is a Paper received yesterday, written by Scottish mental health and human rights activist Hunter Watson, Aberdeen, sent to Colin McKay, Chief Executive at Mental Welfare Commission for Scotland, copied in to various Members of the Scottish Parliament and other campaigners. 20 June 2015: Hunter Watson Paper: Section 242 of Scottish Mental Health Act 2003: is it ECHR compatible? "In the attached paper I point out that section 242 of the 2003 Act authorises the compulsory treatment of an adult with capacity. That is contrary to the advice of the Millan Committee, the committee that produced the report upon which the 2003 Act is based. The paper also draws attention to the fact that a judgment of the European Court of Human Rights makes it clear that the Court assumed that an adult with capacity must not be subjected to compulsory treatment. That was made explicit in a recent judgment of the Supreme Court. There is a high probability that section 242 of the 2003 Act is not compatible with some Convention rights and hence, by virtue of section 29 of the Scotland Act, that the 2003 Act is not law. The Minister should not be permitted to evade making detailed responses to the points made in the attached paper by again claiming that he is confident that the 2003 Act, underpinned by the Millan principles, is compatible with the European Convention on Human Rights. The Minister should instead put in place without delay arrangements for conducting a wide review of the 2003 Act as requested by Richard Simpson and the General Assembly of the Church of Scotland. I understand that the Scottish Parliament will be discussing the Mental Health (Scotland) Bill on Wednesday 24 June. I await with interest to find out whether the Minister accepts that there is a need for a wide review of the 2003 Act and also whether he is prepared to assure Parliament that the 2003 Act, amended by the Mental Health Bill to form the 2015 Act, is compatible with Convention rights. It would be wrong of him to offer Parliament any such assurance."